One of the greatest thing I’ve had to work with, for myself, has been patience. I have always been a very impatient person – even when it did not serve me well. Courageous individuals – leaders – trust. They trust that everything’s exactly as it is supposed to be – they let go. They do not try to control things, events or people. Nor do they force their own ways – swim upstream. They go with the flow – with trust – and find pleasure in it. Trust lies at the core of all our relationships – without, theres is no foundation for growth. “It’s fine to want things to happen in a proper and timely way. But what if you need to hang in there for several months in your current job before you can move on to a better one. Now what? 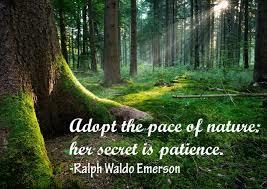 Patience means handling delay, difficulty, or discomfort without getting aggravated. Circumstances are what they are, but patience protects you from their impact like a shock absorber. In contrast, impatience interprets circumstances as you being hindered or mistreated, so you feel frustrated, let down, or annoyed. Then insistence comes in: “This must change!” But by definition you can’t fulfill that commandment (otherwise, there’d be nothing to get impatient about). Impatience combines all three ingredients of toxic stress: unpleasant experiences, pressure or urgency, and lack of control. Impatience with others contains implicit criticism and irritation – and people want to get away from both of these. Just recall how you feel when someone is impatient with you. Or consider how others react when you are impatient with them. Impatience is dissatisfaction; it is resistance to the way it is. Patience senses a fundamental alrightness, the doorway to contentment. Impatience is angry; patience is peaceful. Impatience narrows down onto what’s “wrong,” while patience keeps you wide open to the big picture. Impatience can’t stand unpleasant feelings; patience helps you tolerate physical and emotional discomfort. Impatience wants rewards now; patience helps you tolerate delayed gratification, which fosters increased success and sense of worth. Patience may seem like a superficial virtue, but actually it embodies a deep insight into the nature of things: they’re intertwining, messy, imperfectible, and usually not about you. Patience also contains a wonderful teaching about desire: wish for something, sure, but be at peace when you can’t have it. Patience knows you can’t make the river flow any faster.